Now, this page represents the available races in the kingdom hearts Universe. Most of them are known, but this time there are some NEW races that have yet to be heard of or seen. There may be even more so check the page often to see if a new race has appeared! Heartless are a race darkness created by the manifestation of darkness in peoples hearts, or by someone losing their heart. The race is commonly known and well known. Hearts who are stronger, tend to resemble more monstrous and evil beings, while weaker hearts seem to resemble weaker and lesser heartless. Nobody are what you could call the "empty shells" of a heart that has been devoured and swallowed by darkness. The result is an emotionless being who resides in the realm of twilight. Shunned by light and darkness they are an abomination to the balance of life and therefore reside in the middle wishing to regain hearts. Opposite of heartless, the more strong-willed a heart is, when it is taken by darkness or lost, the more likely that heart will be able to go on as a human nobody instead of one of the lesser. Now, those are the races your used to seeing, but with the advancement of the plot, there are three more, and may be EVEN more later! An enemy whose strength is superior to that of the power of the keyblade. This enemy, is an enemy of light as well, absorbing the light given off by the keyblades and using them to become stronger. They are seemingly childish and unaware beings but when they encounter a key-wielder they change 180 degrees to a completely different personality. 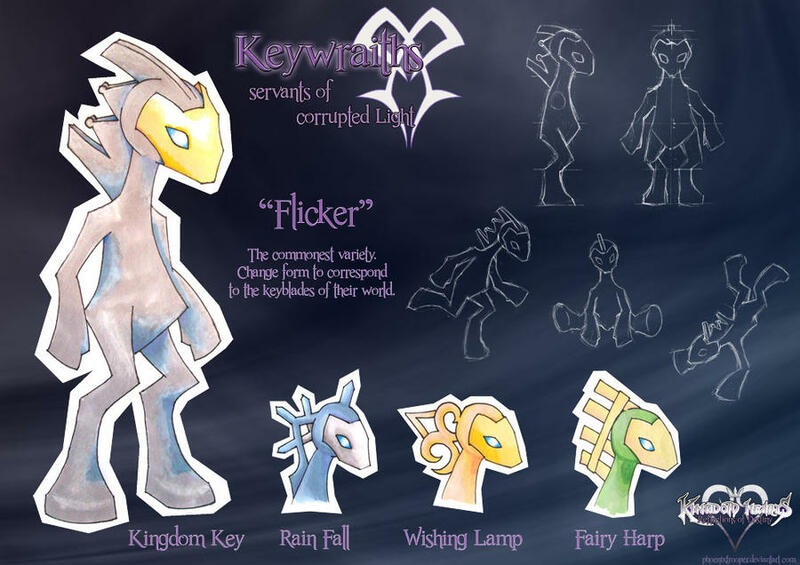 Each Keywraith resembles a keyblade in some way and they usually change to resemble the world they reside in. Powerful enemies, they have yet to be seen in action. The Remimed are another new race that have yet to be seen, and if have been it is rarely understood how. The remimed are beings that take the emotions of hearts and the emotions of people, and shape them into an image creating a form almost exactly identical to the heart they shaped. Similar to shape-shifters, this race thrives on emotion and uses it to shape themselves and things around them making them versatile and powerful enemies. However, the one drawback is that depending on the emotion they can be manipulated into that state permanently changing who they are and their ability to use emotions completely. Lockhearts are the third new race to be added to the Kingdom Hearts races. Lockhearts are what you could say heartless truly are. The darkness in their hearts have manifested to such a level that it has sprouted intelligence and a new form of darkness. The heart when hitting this stage compiles and meshes with the rest of the hearts creating one corrupted heart. That heart is then used to unlock the heartless's true potential granting them control over the darkness to a higher extent and giving them an innate ability that hence their name. When a heartless becomes a Lockheart, as a fail-safe in case that heartless is destroyed, the heart creates a lock on itself that refuses the keyblade. Which goes to say when a lockheart is defeated instead of it's heart being released, it's body turns into darkness and dissipates, but the heart stays with the body moving on until a shadow takes it and absorbs it allowing the lockheart to take over and evolve that body. These heartless derive from the darkness around them, as long as there is darkness around these creatures can never really die, just be destroyed. Eventually they would regenerate. They all have one thing in common, they can bend the shadows around them to be used as weapons of sorts, tentacles, spikes, ect. These creatures are born from Pure Blood heartless, meaning Heartless that where born from the Darkness in peoples hearts. They only survive because they don't have Hearts to interrupt with the darkness that surrounds every portion of their being. The creation of a Pure Darkness Heartless is a simple thing, you grab a Pure Blood, and pump it with pure darkness from the dark realm, or the undeveloped parts of space.